As awesome as our gadgets are, truth is they are manufactured in conditions we tend to not think about much. Samsung might have just concluded it employs no underage workers and might have somewhat polished its public image, when a report by Korea’s Workers' Compensation and Welfare Service judged that a worker in one of its plants died of breast cancer. The woman had worked at the Samsung plant for five years and has had the cancer for three, enought for the Workers Service to agree about a "considerable causal relationship" between the employment and the cancer. "There was an exposure to organic solvents and radiation. The earlier the exposure is, the more likely the cancer is caused." The sad news is the woman was only 36 years old when she passed out, three years after getting the diagnosis. And the blame lays squarely on Samsung on this case - the manufacturing plant in question is allegedly lacking a radiation detector, and workers had to deal with carcinogens like benzene. This is just one of many cases undergoing in South Korea, a red flag raised to us to keep on questioning tech companies about the conditions of their workers. And appreciate a little more the technology we are getting. Actually, it's her fault 4 not quitting after the cancer, AND because she probably didn't read the workers manual about the part where it said: "no radiation detector"
So its her fault she got breast cancer? Come on man that's just ridiculous. Wtf grab popcorn to watch people died in cancer? Don't you have sense of humor? Man this is just wrong...no other way to put it! To be fair it is not yet proven that the cancer arose due to working at sammy but most likely...that being said.... be it sammy or apple or anyone this is just wrong! I mean I love my samsung phones but I dont love any gadget enough for it to cost even a single human life! And the folks above grabbin popcorn....start eatin it from the other rear end ..i cant believe it you wanna grab popcorn after hearin this! You kids grab popcorns, i'll grab a beer... By the way, isn't there anything people can do without using these harmful stuffs. We know it's bad, they know it's bad...what's the point! But since this case has only one death involved (hate to say it), Samsung might get away with it, not blaming the manufacturer. The regulator should look into it Samsung is rich enough to pay for better working condition. Wow! Samsung is really copying apple to the extreme now!!! iDiSagree, Samsung has a better manufacturer's warranty; worth looking into (in this case). Lol yep u can see that now haha. If they were copying apple they would have had better working conditions. this shouldn't be a apple vs google or apple vs samsung article. some one lost there life to an ailment (this case cancer) and the possible cause is working condtions this could happen to any company or any person either way its sad that it happend. 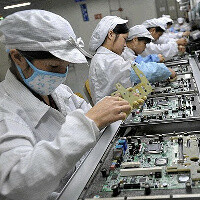 like the article states we do not always concider the people that make the product and the conditions they live and work in hopefully this means tech companies step up and make sure there employies are taken care of propperly not only making sure that conditions in the factory are up to proper code. or even making all companies meet a global standard for there factories. The workers would also commit suicide instead of getting cancer. Lol I didn't know apple cheer leader was a job. What a bunch of hog wash, women (and, men) die of Breast Cancer every day; their environment is, more often than not, not a causal contributor. Consider all the people who develop Lung Cancer (and, die), many of them have never smoked or been around smokers but, based on the "story" above, if they work at, say, a 7 Eleven, therefore, it's 7 Eleven's fault for having cigarettes on the premises?? My theory is: maybe the woman who died of breast cancer in South Korea sat next to someone on a public bus who was using an iPhone that was leaking low levels of the radiation leakage that has been reported! This is stupid. How many people work here and how many have cancer? 1? We work around everything that causes cancer. If you read McDonalds fine print on their fries in the nutrition wall, it says it can cause cancer. Cancer is here and it's always around us. ALWAYS. Unless you live in a cave away from anything man made. She had cancer for 3 years.. of course it's Samsung's fault!!! It would be interesting to see the actual report and if there truly is a link. Nobody can deny that being around these hazardous chemicles and radiation while working 40 hrs (or 100) a week will be detrimental to your health. The way this was reported is ridiculous. Having said that.. shame on Samsung if they don't have the proper detectors and safety measures in place to protect their workers. FIX IT and don't turn into another Apple here! There is no proof its Samsungs fault especially if she had the cancer for three years. There should be multiple cases with the same or more years. Then I might say there could be a link to cancer. What about people that work at gas stations? This would be like saying its South Koreas fault for not providing healthcare if they dont have it. Its an unfortunate death, but you cant be pointing fingers if she did not get medical attention. Maybe she couldnt afford it and that is the sad truth. Most people cant afford it and they depend on peoples charity at the cancer hospitals. We have to stop acting like these companies are so much more different from each other. Sure, we all have our favorite products, but that doesn't excuse business practices, especially if they hurt people. Now, tying something like cancer to a specific thing is a tough thing to do, but if it is something to do with Samsung, then it needs to change. Period. Don't let your love for a smartphone outweigh the cost of a human life. Don't make excuses for Samsung IF (and only if) they are to blame for something like this. It frustrated me to no end that Apple partners with a manufacturer that has to hang nets around the dorms so workers don't kill each themselves. It still does and I don't make excuses for them. No one ever should. People are more important than gadgets or brand loyalty.